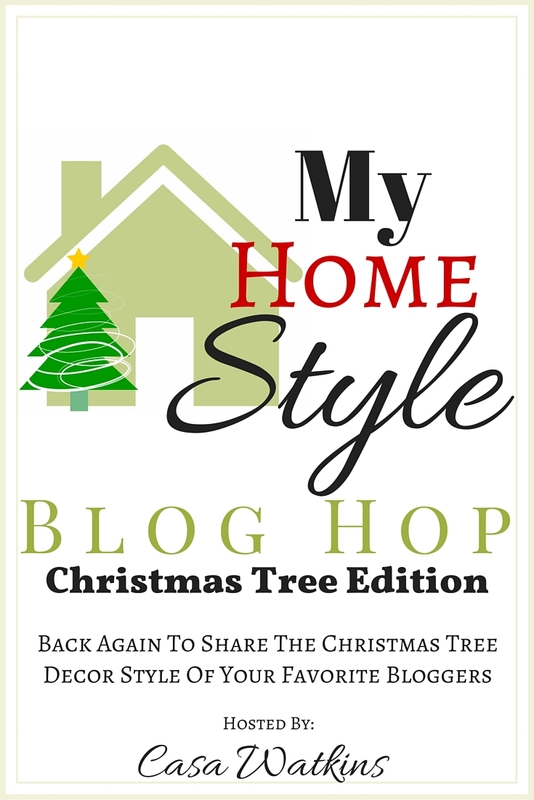 Welcome to the My Home Style Blog Hop: Christmas Tree Edition, hosted by Stephanie at Casa Watkins. I’m so glad you’re here! If you are coming over from Erica at Designing Vibes, let me introduce myself. My name is Sarah and here at Little Red Brick House I like to share my love of DIY and home decor. I would definitely describe my style as farmhouse but with more of a modern take. You won’t see any cow or chicken decor in my home. 😉 I like to keep it classic and simple with natural elements mixed in. That definitely carries over to my Christmas decor too, as you can see. 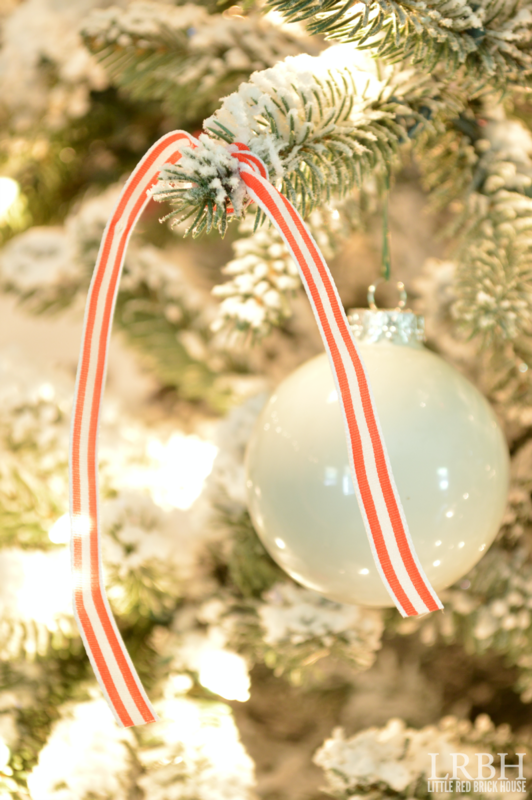 I went with a classic Christmas color scheme of red and white this year. It was the first time we flocked our tree and I must say that I am absolutely in love with it. I love the way the red pops off the snowy white. 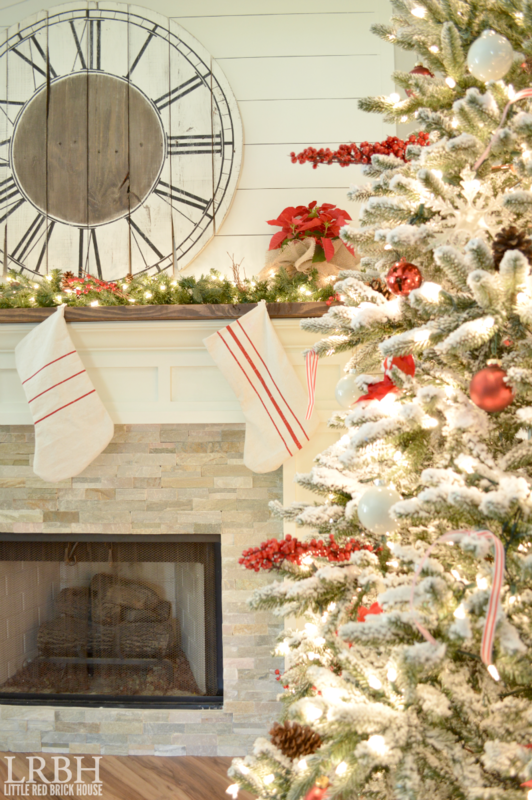 I slipped a few nods to farmhouse style in there with red striped ribbons and a red ticking stripe tree skirt. I just draped some extra ticking fabric I had leftover around the tree base. Simple and no fuss…except when the kitties decide to be little toots. Thanks so much for stopping by my little Christmas tree tour. I hope you’ll come back by again sometime! Next, you’ll want to scurry on over to Lovely Etc. to catch Carrie’s lovely tree. And if you came into the hop at the middle, no worries! You can start from the beginning at Casa Watkins. 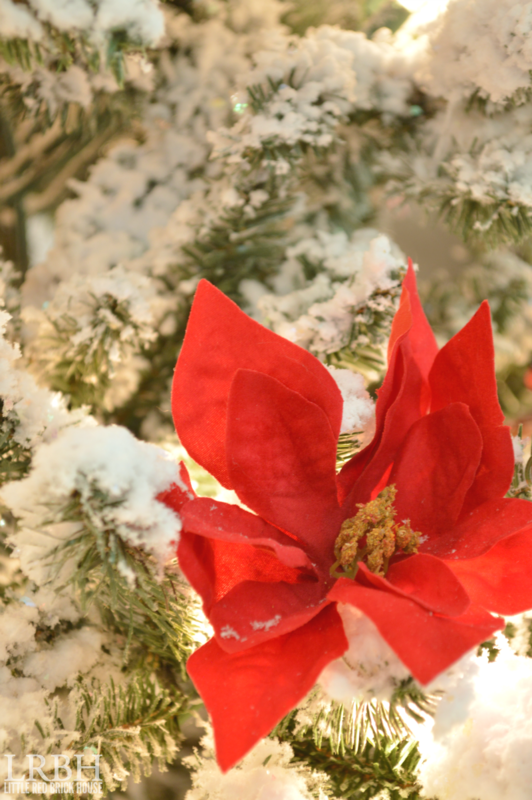 Your flocked tree is beautiful! I’ve been considering one for the last few years and yours is so pretty… Really enjoyed your post! I love, love your tree. 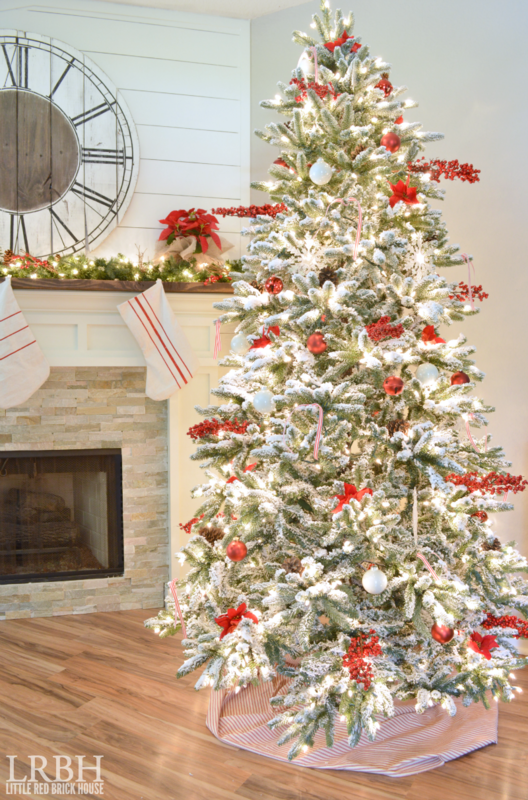 The snowy white is one of my favorite looks for a tree and then you adding the pops of red is perfect. Well done! Sarah, your tree looks gorgeous! 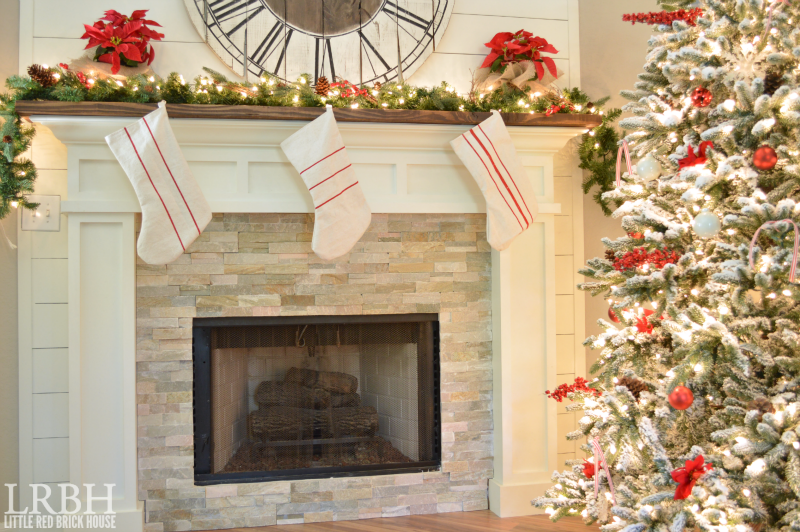 Of course I love the flocking and it sets off your beautiful red decorations perfectly. Those berries are the perfect touch! I may have to get a few for next year myself. Simply stunning Sarah! Wow! Love the added touched of red ribbon! The whole room is magical. 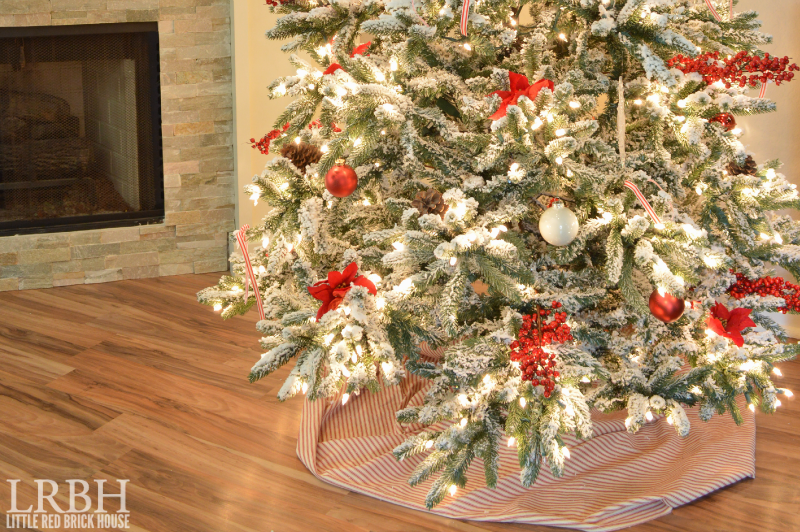 Your tree – and your whole home tour, come to think of it – are absolutely stunning. I LOVE the flocked tree with hits of red!! Gorgeous!! I wanted to pin but for some reason the button wasn’t working. Not sure if it is my computer or pinterest right now or what…but I will come back and check again later! 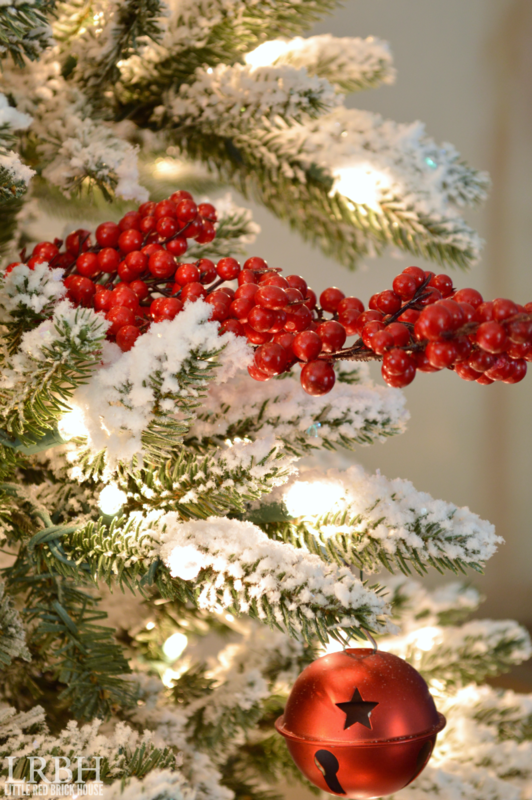 Your tree is beautiful, Sarah! I love that you flocked it too!